September is National Preparedness Month, so this week we are focusing on how to be prepared to deal with extreme weather. Dr. Michele Frazer from Hagyard Equine Medical Institute stopped by the USDF office to talk about how to be prepared for the most common natural disasters. 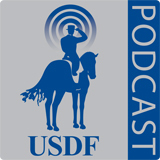 Mark Coley from US Equestrian joins us to talk about the USEF Equine Disaster relief fund and we have an excerpt from a convention education session on dealing with emergencies featuring Dr. Laura Werner. Dr. Michele Frazer DVM, DACVIM, DACVECC, Lexington, KY, joined Hagyard Equine Medical Institute as an Internal Medicine Specialist in 2004. She has a particular interest in critical care medicine and regularly speaks at nationally recognized meetings including the AAEP and ACVIM forums and publishes in veterinary journals. Laura Werner DVM, MS, DACVS, Lexington, KY, joined Hagyard Equine Medical Institute as a Surgery Associate in the Davidson Surgery Center in 2011. She has worked as an FEI Veterinary Delegate at some of the top Three-Day eventing competitions in the United States. This week, Lisa Gorretta joins us to talk about the 2017 US Dressage Finals presented by Adequan® . We have answers to your questions about the Great American/USDF Regional Championships and part four of the series on rider biomechanics with Dr. Hilary Clayton. Lisa Gorretta, Chagrin Falls, OH, serves as the USDF Vice President, she is also a USEF ‘R’ Technical Delegate, FEI Level 2 Steward and Co-Chair of the USEF Dressage Committee. Hillary Clayton BVMS, PHD, DACVSMR, MRCVS, Mason, MI, is an equestrian, veterinarian, author, researcher, and clinician, Dr. Clayton has conducted targeted studies on bitting, saddle fit biometrics, kinematics and kinetics, and locomotion . She established Sport Horse Science, LLC. and is vice president of the American College of Veterinary Sports Medicine and Rehabilitation. Dr. Clayton has been inducted into the International Equine Veterinarians Hall of Fame, the Saskatoon Sports Hall of Fame and the Midwest Dressage Association Hall of Fame. As a rider, Dr. Clayton has earned her USDF Bronze, Silver and Gold Medals.